"Ride over obstacles, not around them." Going around obstacles widens trails, impacts vegetation and causes erosion. Challenge yourself by staying on the trail. 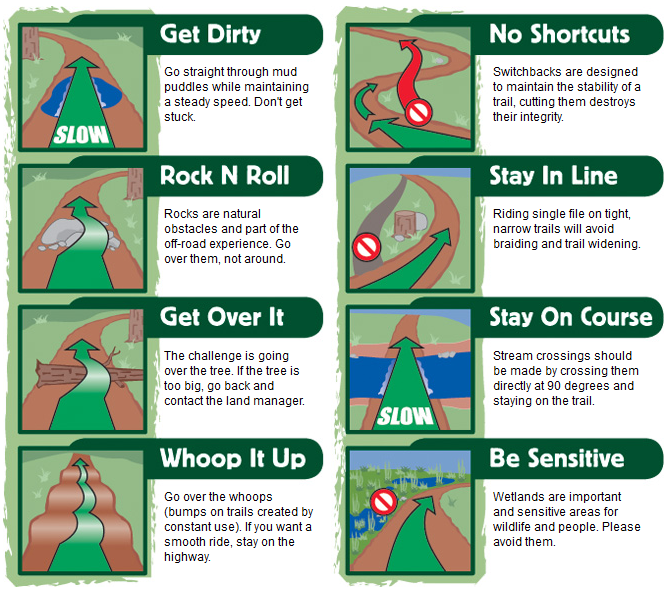 Use caution when going over obstacles and remember to be courteous to other trail users. It is recognized that the depicted activities involve inherent risks and that the safety of the operator and participant depends upon the prudent exercise and discretion of the operator. This information is *not* intended to provide guidance on how to negotiate obstacles, but rather for protecting the environment. Consider the severity of the obstacle, the capability of the vehicle and your experience level while crossing obstacles. Always use proper protective gear manufactured for your off-highway experience. Safety gear and equipment requirements are dependent upon the type of vehicle. Consult your dealer and vehicle manufacturer for specific needs. The parties publishing this information hereby disclaims any and all liability associated with the provided information or arising from the depicted activities.